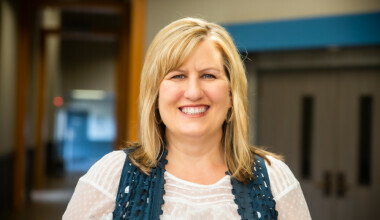 Stacey is responsible to help people transition from first time guest to a place of connection in the life of Grace. She oversees several volunteer teams designed for this purpose. Whether in a community group, campus class, or place of serving in the church, Stacey knows that taking one step beyond just Sunday morning attendance will give people a sense of “belonging” and connect them to the life and mission of Grace Covenant. It’s a way to help this large church seem not quite so large. Serving in local church ministry has been a compelling call on Stacey’s life since age 15. Before coming to Grace Covenant, she served with her husband Tim as youth pastors in Nebraska and also Lead Pastors in Pennsylvania. Prior to assuming her current role in August of 2012, Stacey served in several staff and volunteer positions since 1997. She received a Bachelors Degree in Theology in 1990 and has been an ordained minister since 1993. Stacey loves spending time with her family and friends. She has been married to her husband Tim since 1990, and has been blessed with four sons: Matthew, Aaron, Andrew, and Benjamin.